A wide range of treatments can be applied to leather - read on. Leather is often seen as a lost cause when it becomes damaged. This is not the case, and it can usually be rescued, leather conservation has become much more sophisticated in the last 30 years. The items that can be treated range from gilt leather and painted leather screens and wall coverings, to car seats, furniture, chests, toys, luggage, boots and shoes, coaches and carriages, buckets, jackets etc. Click on the samples listed below to get an idea of the range and what can be done. Examples of work - follow the links. Gilt and painted leather. Gilt leather and painted leather are most often found on screens. In the past it was also widely used for wall hangings (see right). Upholstery on furniture. Splits can be repaired and lost colour replaced in worn areas. Toys. Stanley, a much loved leather horse brought back to life! Car seats. The leather can be conserved for display and sometimes it can be restored so that it can be used. Boots and shoes. Vesta Tilley's boots, thigh boots and a child's waterlogged boot. Greta Garbo's make-up box A leather covered box which belonged to Greta Garbo and was given to one of her friends. 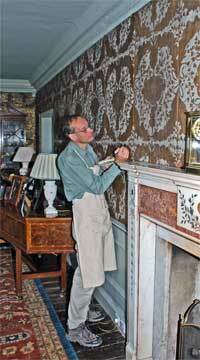 Theo Sturge conserving gilt leather wallhangings for a private client.